If you have been sued in an Alabama collection lawsuit by the debt buyer Midland Funding, you have a lot of company. 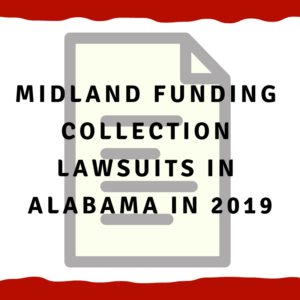 From January 1, 2019, to March 15, 2019, Midland Funding filed 3842 lawsuits in Alabama. That’s 3842 lawsuits in 74 days. Over 51 lawsuits a day — every single day of this year. And these lawsuits are filed all over the state — from Madison County in the northern part of the State to Jefferson County to Montgomery County to Mobile County. And every other County in Alabama. Zarzaur & Schwartz, PC in Birmingham. Moxley & Associates, LLC in Montgomery. Both of these law firms sue consumers all over Alabama for Midland Funding. Most people sued just . . . give up. They do nothing and a default judgment happens. Or they assume they owe Midland because they owed the original credit card. You have other (better) options — keep reading to find out . . . So what do you do if you are sued by Midland? First, take it very seriously as this is the debt collection firm that files the most lawsuits in Alabama. And it has two of the best collection law firms that know what they are doing in suing you. Second, figure out your deadline to respond to the lawsuit. You first start with the date you were served. Then you have 14 days from the date of service to respond if you were sued in District or Small Claims Court. If you were sued in Circuit Court, you have 30 days from the date of service. Fourth, take action now! This is the most important step. You must move. You must take action. Or all the knowledge in the world is worth nothing. Many actions you take can be corrected even if they are wrong but doing nothing is very hard to correct. It is kind of like driving — you can change direction if your car is moving. But that’s hard to do much if your car is standing still. Think of GPS — you need to know your current location and where you want to go. Then the GPS helps you figure out the best route. First, by helping you understand where you are right now. When were you sued, how much were you sued for, etc. Second, we can help you figure out where you want to end up — settlement, fighting the lawsuit, having your credit report cleared of Midland, etc. Finally, we help you see the best path to get from where you are today to where you want to end up tomorrow. Call us at 205-879-2447 and ask for Carolyn — she will look up your lawsuit in Alabama and help you immediately on the phone. We are here to help you — give us a call now or fill out our contact form. From March 16, 2019 to March 24, 2019, Midland Funding filed an additional 490 lawsuits.